I liked the cover, and the blurb. Trust the Focus was a complete wow for me. This is an incredible coming-of-age tale that had me crying, had me laughing.... I shouted at both Justin and Landry more than once. I was so invested in the story - truly, this is an amazing book. Justin's inner struggle - though at times dips into perhaps overly angsty - about how to deal with his attraction to Landry broke my heart. The question of whether Justin will come out and what that will mean for his life is really at the core of Trust the Focus. It's an issue with many facets - not only does Justin worry about his ultra-conservative mother's reaction, but also that of his best friend (and crush) Landry who has been out for ages, his former teammates on the emphatically heterosexual university baseball team and the world in general, which can be less accepting of homosexuality than it should. On top of all this, Justin's also going on a road trip to celebrate his father's life, visiting sites featured in a calendar his father photographed, and spreading ashes along the way. That journey alone would be enough to make a person emotionally unstable, but when you mix in close quarters with the completely off-limits but oh so touchable Landry.... Yeah, poor Justin. I couldn't tear myself away from this book - it was so emotionally powerful, I needed to reach the end and know how it would all work out for Justin. Both he and Landry stumbled at different points. I thought their reactions to various situations were quite believable, though at times so frustrating. I wanted them both to be more understanding of each other, more sympathetic to what the other was going through - but in a 'I'm so invested in what happens here, I can't take any more!' kind of way. Such a good book. Seriously, guys, go read it. 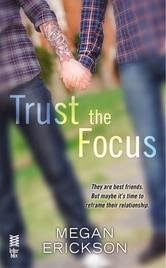 If you've never read LGBT fiction, and been looking for a good book to start with, or if you like great contemporary romance, or if you like great road trips, or maybe you just like great books - read Trust the Focus. Read it. Yes, it's angsty at times, but it's also really, really good. For fans of contemporary romance, LGBT fiction, coming of age stories.